Facts and history about the life and lifestyles of Native American Indians. Many Native American Games and sports were designed to prepare for hunting and for war. But the people also enjoyed leisure activities such as story-telling, feasting, music, songs, dancing, gambling games and athletic contests. 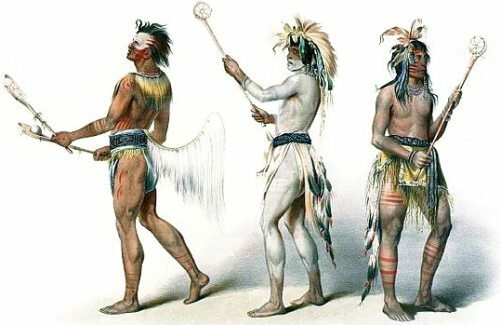 It was important for the men of the tribes to remain fit and many of their games, such as chunkee, included hard running and endurance. These games included stickball, an early form of lacrosse, in which the ball was caught with a netted ball stick. Other Native American games included foot races, canoe races, tug of war and numerous types of target games.